SALT LAKE CITY (AP) Offense trumped defense on a night when one of the NBA’s most efficient offensive teams met one of the top defensive units. 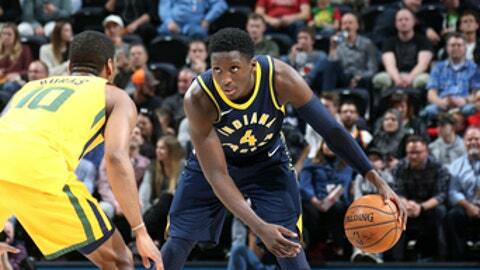 Victor Oladipo scored 28 points and the Indiana Pacers shot 54 percent from 3-point range in a 109-94 win over the Utah Jazz on Monday. ”Execution,” Pacers coach Nate McMillan said. ”We talked about establishing our pace, but controlling the tempo. We didn’t want to get in an up-and-down game and allow the crowd to get into the game. Our guys did a nice job of taking opportunities early when we had them. And if we didn’t, we made them defend and were able to execute and score. Oladipo got going late in the second quarter during a 15-2 run that gave Indiana a 14-point lead. Then his back-to-back buckets early in the third capped a 9-0 surge to push the advantage to 67-47. He also had six rebounds and six assists. ”Guys were getting wide-open shots,” Oladipo said. ”Guys shooting the ball with confidence. Domantas Sabonis finished with 15 points and eight rebounds for the Pacers, and Thaddeus Young scored 17. Donovan Mitchell scored 23 for the struggling Jazz, while Derrick Favors added 16 points and seven rebounds. Utah has lost 15 of 19. ”We’re not playing with a lot of confidence on offense right now, both individually and collectively,” coach Quin Snyder said. ”If that’s the case, you can’t force that. You just got to connect even more and, in some respects, it puts more pressure on your offense. The Jazz put themselves in a hole with seven first-quarter turnovers, but rallied with a 14-0 spurt in the second to cut the deficit to 38-37. They never got that close again. The Pacers were efficient on offense all night, shooting 53 percent from the field and 14 of 26 from 3-point territory. Indiana is 15-0 when shooting better than 50 percent. Pacers: Indiana began the night ranked second in the NBA in 3-point shooting at 38.3 percent. Jazz: Raul Neto returned from a 15-game absence due to a concussion and bruised left knee. … Rudy Gobert went through an extensive workout with braces on both knees before the game. He’s thought to be close to returning from a left PCL sprain and bone bruise. Pacers center Myles Turner did not play due to a ligament sprain and muscle strain in his right elbow. He will not play the remaining three games of the road trip. The team lists him as week-to-week depending on how quickly Turner heals, but said he will not need surgery. Jazz forward Thabo Sefolosha has been diagnosed with a serious right knee sprain and wore a bulky brace before the game. The team has not announced a timeline for his return, but there are fears it could be a long-term injury. Pacers: Travel to face Damian Lillard and the Portland Trail Blazers on Thursday. Jazz: Travel to play Zach Randolph and the Sacramento Kings on Wednesday.